« The Ultimate in Brand Loyalty, Bobby Stokes and a Pencil case? This entry was posted on June 6, 2011 at 3:03 pm and is filed under Irish Economy, Personal development, Positivity, Recession, Uncategorized. You can follow any responses to this entry through the RSS 2.0 feed. You can leave a response, or trackback from your own site. Enjoyed this post Greg, I had a friend who always saw the negative and downside to everything. I’ve politely moved on. As much as you like them you have to protect yourself and your own well being ! I am a realist, who faces and handles things with an optimistic approach and attitude. thanks Frederique – without guessing too hard I think I knew what you would be doing with the sails of your boat! I obviously don’t know what in fact your friend was saying, however, maybe it would have been wise to go a little deeper with him to discover what lay beneath, what you perceived as his negativity. I don’t believe people can sap us of our energy, unless we allow them too. Maybe the opportunity for you here was to look at this for yourself. Maybe you need to have boundaries around this friend and be “separate” from him. As in all relationships the more separate you are means the more together you are. The concept of separateness was alien to me when I first heard it. It took me a long time, in fact, to understand it. My understanding of being separate is this….. Suppose while you were listening to your friend, you decided to just listen to him & hear all he was saying, without interruption & by not allowing yourself to become emotionally involved. Then when he finished, you asked him questions about why he felt as he did and how it came about that he felt this way? Were there other issues going on for him? What was his fear? Rather than focus on his “Outlook”, you began together to focus on his and your “Inlook”! This is not the general way we interact with each other, is it? However, the benefit of doing so for both of you, might have been, that you both may have discovered the deeper meaning of why he was feeling so negative and why you are so optimistic. As this was an opportunity for both of you to deepen your relationship with each other and with self. However, our defences / protectors can get in our way of seeing such opportunities. I note your defence here “For me I recognise that part of my own personal armour is adopting a positive approach”. Every human being has protectors/defence’s or personal amour, it is how we have learned to be in life. As adults they tend not to work as well for us, as they did when we were younger, so therefore, life/people/situations offer us opportunities to explore, why do I have this defence? Is it necessary now? Is it serving me? Or is it blocking my own growth to maturity & self knowledge? The most important relationship is with self and it through our interaction and relationship with others, are where opportunities abound to deepen our relationship with self. thanks Trich for taking this even deeper!! If U even attempted to take the conversation a little deeper with my buddy I would have been the one left sitting there!! the optimism / pessimism thing is interesting because there is no doubt we are affected by the prevailing mood and it can be very difficult to act contra to that. It becomes part of the whole picture and affects the way we act. Its what contributes to boom / bust cycles, people don’t act rationally but are far more likely to follow the herd mentality. If the herd feels optimistic then spending and investments booms, if it feels pessimistic there is an increase in savings and a reduction is economic activity. The first over stimulates the economy the second causes it to slow down, boom/bust. Quiet often this is done without initial rationality and then feeds on itself. Investor Warren Buffett regularly runs against the prevailing mood, he stayed out of the dot com boom and was written off as being past it only to be proved right and he jumped in to pick up stocks when everyone panicked after Lehmans. Generally we over do the optimism in the good times and the pessimism in the bad times. 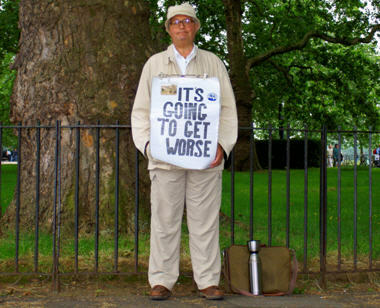 Presently we are way overdoing the pessimism and that is damaging the economy hugely. Great post Dermot – the lesson is that the hole we are in should not be as deep as it is because of the overall “mood” – left the mood and the hole gets smaller. Easy answer. Be an optimistic pessimistic with realistic tendencies, and keep your own counsel. This way everybody thinks they understand a bit of you, while you know nobody really gets you. Hmmmm … that’s a little too complicated for me Paul! Pessimists and optimists – we need ’em both. The main thing is to get the balance right – about 60/40 (optimists to pessimists) I’d say. The product then is something akin to realism. The aviation sector is heavily populated by ‘analysts’. Analysts fall into the categories of optimist and pessimist. In recent times however, the 60:40 ratio seems to have changed – the pessimists rule! The [remaining] optimists constantly remind us that over the long cycle investment in aircraft is essentially good for your health – the old market ingredients of demand-shortfall [capacity]-order lead times-replacement cost, etc which traditionally produce the upsides – forming the seedbed of their forecasts. But the pessimists provide the timelines for ‘recovery’ and these timelines substantially influence the availability of funding – the oxygen of our industry. The logic of the optimists – well founded in thecommercial history of the aviation industry since the end of WW II – is thus ‘parked’ for the time being. Is this ‘realism’? I would say with things in general the 60:40 of optimists to pessimists has gone to 10:90 with many plans and decisions made on this basis. Take the economy – why is the hole so big? The pessimists are ruling big time – once optimism starts to “root” , confidence will return and more business as a result – this will salvage our economic problems and not austerity budgeting, which is just digging the hole deeper. The pessimistic tail is wagging the very sick dog at the moment!! Good post — I try to remain realistic even if I feel the situation is unfair by looking at the reasons why it’s not working to my advantage. There’s a saying that if it doesn’t happen it was not meant to be and something else is in the cards that is better suited. I do believe this…but my patience can wear thin at times! a little bit of “fate” stuff going on there Mary! We ended up being screwed over totally on a job by a client who basically robbed us but the work did have us spending a lot of time close to a family member who was very sick at the time – fate? … that’s my way of rationalising the horrible time we went through. @ Mary Dolan, It is the vulnerable human part of being a human being, I feel like you do, just now. Sometimes, it is very hard to see the wood for the trees. This station isn’t an easy one. While I am normally a kind & compassionate human being, these last few days have been amongst the most challenging in my life. Being positive & upbeat isn’t always an easy place to get to, however, right now, in the vulnerable sad place I am in right now, there is, I know, an opportunity for me, just right now, I can not see it! It’s a place called life! And knowing there is a positive within the negative, isn’t easy or comfortable right now! My patience is wearing thin too! But I hope in tomorrow! I love me in the now. I hope I learn from what has just passed?!? you will win through Trich , no fear!